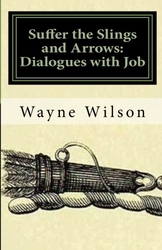 Suffer the Slings and Arrows: Dialogues with Job by author Wayne Wilson is a fictional narration of the classic Old Testament Book and one of the oldest books of the Bible, The Book of Job. As most Christians may be familiar with the Book of Job and his sufferings, the author has written an intriguing fictional account, taking the reader back in time to 15 years after Job encountered his sufferings. As noted in the popular cliché, "Time heals old wounds" the author thoughtfully takes a look at how Job's sufferings affected each character emotionally, socially and spiritually. The author reveals Job's relationship with God, therefore asking and answering poignant questions that arise throughout the Book of Job. If you have ever had trouble enduring or understanding the book of Job, consider this book that delves in deep and gives the reader a practical look at the Book of Job through the creative use of dialogue, scripture and encouragement. This inspiring read will challenge the reader to come up higher in their pursuit of God while they consider God's servant, Job. Regarded as one of the greatest literature books in history, the Book of Job has a significant meaning to many who walk the "straight path." Within these turbulent times, people need to know who their redeemer is and that whatever happens they must gain an attitude of Job who triumphantly proclaims, Though I be tried by fire, yet I shall come through as gold, and Yea though He slay me, yet I will still worship Thee. As the author notes, "The story of Job encapsulates the story of the Old Testament and is applicable to all. Job encourages us to rise above the suffering and find contentment in God Himself…not in His provisions. Seek God's face, not His hand." Answering the question of, is love really love when there is no hidden agenda behind it? Capturing the essence of the time period and the timeless message of the Book of Job, readers will develop a deeper knowing and a deeper knowledge of God through this delightful and well written book from an author who has always been intrigued by the Book of Job and it's purpose. A highly recommended, entertaining must read that will keep you coming back for more. You may get your copy of Suffer the Slings and Arrows: Dialogues with Job on Amazon . ~ A CBM Christian Book Marketing Book Review, sharing Christ with the world.